HomeAll postsblogCan the weather heat up your content marketing? “You can plan a pretty picnic, but you can’t predict the weather.” – so said Outkast, one of the greatest one (maybe two?) hit wonders of our generation. Now, the lyrical wordsmiths André 3000 and Big Boi may not have been thinking about digital marketing when they wrote their hit song Ms Jackson, but that is exactly the connection we are making today. This week the UK experienced a heat wave. By that we mean temperatures hit a sweet 20+ (sometimes even 30+!) Celsius, leading to every balding 40 something-year-old in the country whipping off their shirt and heading to the closest body of water. Because of this uncharacteristically hot weather, a large sum of unusual search queries on Google began to appear – and rise in popularity. How hot does it need to be to leave work? Some of the top “hot weather” queries this week included how to keep a baby cool in hot weather at night? Can petrol tanks explode in hot weather? And how hot does it have to be to leave work? When it comes to content marketing, it’s all about being where your customers are. By that, we don’t mean getting out the office and running to the beach. Unfortunately, there are no laws around a maximum temperature in the workplace, so we all have to keep calm and carry on. 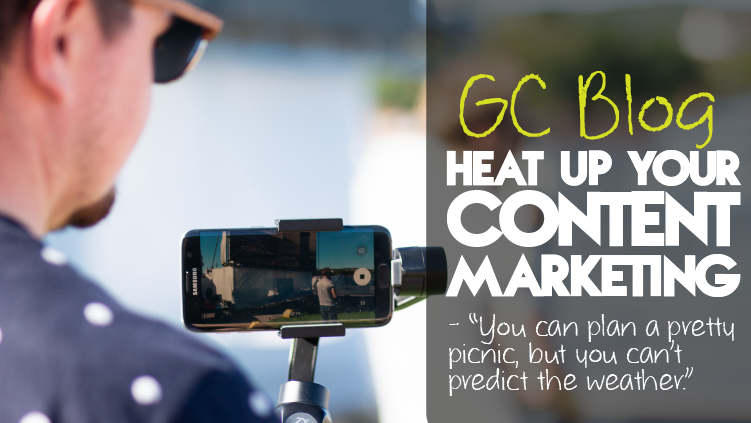 Finding out what people are searching for, saying and doing online is half the game when it comes to digital marketing, and this week it has been all about surviving the heat. What this means for the online world is that if you can make content that answers these questions, then you stand a better chance of getting in front of people. But I work as a secretary for Boris Johnson. What does that have to do with hot air? Now, our advice above doesn’t mean that every website on the internet needs to start answering questions about whether hot drinks can cool you down without any original insight. What it really means is that you should be thinking of your users when it comes to your content. If there are timely factors which will be affecting their day to day life that you can talk about naturally, that is what you should do. Additionally, if you have content that you have previously written that becomes relevant again, re-work it and reshare it. If you wrote a blog about England’s World Cup history four years ago, it is absolutely time to dust it off, update the information and reshare it. Much less time is needed, and you continue to provide quality information in the articles or blogs you share. Having a long-term strategy for content is vital to ensuring your efforts match the goals and ambitions of the business as a whole, but allowing for impromptu blogs or social posts means you are able to react to the weather – even if you can’t predict it. This leaves you in a stronger position to reach your customers, and provide information they actually use. In case you were wondering about the answers to the above search queries; give your baby a cool bath before bed, get a fan and wear less nightwear, and no, petrol tanks won’t explode in the heat. Now get out there, write blogs that hit those topical search queries, and shake it like a polaroid picture. Want to learn more about content marketing from Head Boy Danny Windsor and an array of other industry experts? Book your free place on Sleeping Giant Media’s next #GIANTtalks and learn to Become a Content Marketing Superhero!